A musician with a singer-for-hire service is taken aback when the Dragons decide to showcase some of their own musical talents. 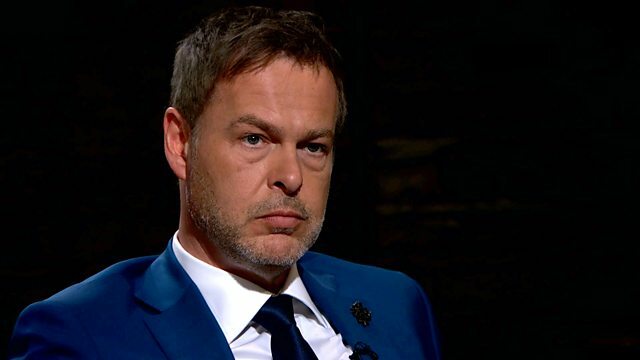 Peter Jones, Deborah Meaden, Touker Suleyman, Jenny Campbell and Tej Lalvani take their seats to face a fresh batch of entrepreneurs hungry to strike a deal. In this heart-stopping show, the Dragons get hands on with a live anatomy dissection business where the entrepreneur is hoping to shock them into an investment. A musician with a singer-for-hire service is taken aback when the Dragons decide to showcase some of their own musical talents. And a husband and wife team make a big entrance into the Den in a tuk tuk, but when a potentially fatal flaw is immediately exposed in their business they may be riding out before they are even off the starting block. The Dragons face a shocking pitch! Your ideas - are they in or out?